No-homework weekends and breaks provide time for students to enjoy activities they would not otherwise have as much opportunity to do during homework loaded weeks, but these weekends can be complicated for both students and teachers. Spanish teacher Carl Atlee explains that no-homework weekends are a great opportunity to “spend with friends and family.” These breaks are vital because they provide occasions when students can engage in activities different than those during the limited free time of the school week. Although students enjoy the amount of leisure, once a no-homework break ends, the respite from work can impact a student’s work-ethic when returning to The Hill. Ben Sanger ’19 said, “I find it hard to go back to a normal week of homework.” Responding to a survey sent out by The Razor, 111 of 387 respondents agreed that returning to school after time off is more difficult. But some students find that having time off makes it easier to come back to the normal Hopkins workload. Arbonies ’18 said, “I feel a little more well rested and a little more prepared,” and 148 other Hilltoppers agreed in response to The Razor survey. 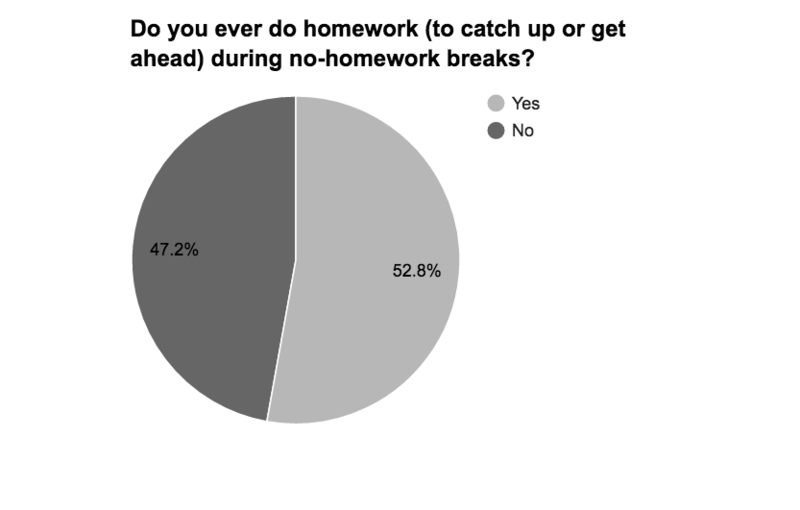 Although no-homework breaks are a time for taking a step back from the normal Hopkins workload, some students use it as a time to catch up or get ahead. Clare Chemery ’19 said she uses the time to “do any long term projects,” while CC Rocco ’20 said, “I might study vocabulary.” Of the 387 students who responded to the newspaper survey, more than half said that they also complete assignments during a no-homework break. The week before may also be less stressful. Arbonies ’18 said, “The week feels less stressful, depending on what you planned and depending on [how much work you have on] normal weekends. No-homework breaks allow students to readjust and relax before moving on in the school year. Rocco ’20 illustrated the sentiment of many Hopkins students saying that she enjoys the breaks “because Hopkins can be stressful.” Of those students who answered the survey, 92.8 percent also agreed that no-homework breaks ease the stress of a Hopkins workload.